Well here goes - for a second time. Typepad announced they were making some changes (making composing posts easier) and I hadn't realised until I logged on they were already in effect. Now I like the familiar, especially when it comes to computers. New features and screen layouts fill me with trepidation. I thought it was about time I gave you a glimpse of the projects I am working on for the Christmas in July weekend at Patches of Heaven, Temora. Only six weeks away and I still have a lot more to do! I love working with felt so naturally I've had to design a felt project. Felt is so soft, easy and forgiving to work with. Next a punchneedle project. If you haven't tried this you really should. It's much easier than it looks and is a beautiful way to embellish bags and gifts. And of course there will be stitchery projects. I'm really looking forward to the weekend. I know its going to be alot of fun, great company, lots of laughs and delicious food. Last weekend, I decided to finish a quilt top started some time ago. 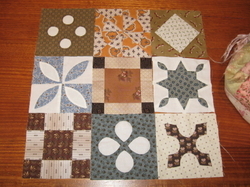 There wasn't much left to do; join on three rows (already made) and then make the border. And here it is. 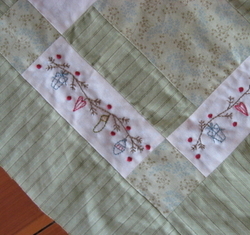 It's called The Finches Quilt and was designed by Susan Smith, Patchwork on Stonleigh. Now I'm really pleased to have finished the top. It can be harder to finish off an old project than start a new one. New fabrics and designs always seem more exciting. I guess I'm being a little cheeky including this one as a finished top. As you can see I've added the border and yes, I did get it out of a Fat 1/8. 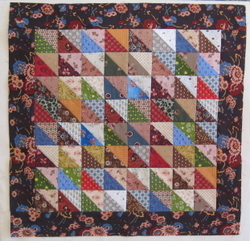 There is a Half Square Triangle quilt in the book Childhood Treasures, p 101 and I liked it because it had a border, instead of simply binding the edge. 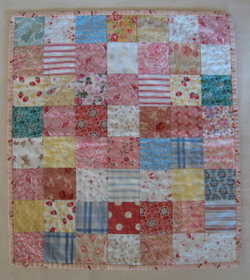 If you look closely you'll see I used a couple of fabrics from The Finches quilt. This is another reason why I love to finish off old projects. I can take all the left over scraps and use them in new projects. I've been doing a little too much hand sewing and computer work over the past couple of weeks and need to take a short break. 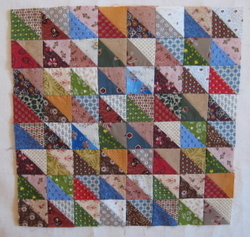 But I can't not do anything, so last night I decided to make a quilt. Now I don't know about you but I don't like choosing fabrics at night. I'm not sure if it's the lighting or my eyes, but I much prefer selecting fabrics and threads during the day. You know how it is though, when the urge to create is strong, so I threw caution to the wind and started cutting and sewing. Now I did have a little head start on fabric choices as I had purchased a small bundle of scraps from Jan. And I wanted to use them before they got 'lost' in my stash. Something quick - half square triangles. The size of the block was dependent on the smallest piece of fabric I wanted to use and the overall size on the fact I want to get the border out of a Fat 1/8. Afterall it is a doll's quilt and I like the idea of being a little frugal just as our mothers and grandmothers would have been. One of the lovely things about sewing on Fridays is the chance to catch up on what each of us has been doing during the week. Now we can always rely on Sue-Anne to have something for us to ooh and aah over. And today Sue-Anne brought along her Dear Jane blocks. You can already tell its going to be very beautiful. What I love most about stitcheries is they are so portable. I can still go to sewing but keep 'working' at the same time. Here's a sneak peek of one of the projects I'll be teaching at Temora in July. Just two more borders to stitch and then I'll be finished - well almost. Look what I bought yesterday at the Holy Spirit School Fete. Now I am very excited for a number of reasons. Jackie (sometimes a Friday Girl) made it from her scraps. Just the fact I know who made it makes it all the more special. Most of the fabrics are new to me, so I've thoroughly enjoyed looking at the different prints. And it's a Dolls Quilt. 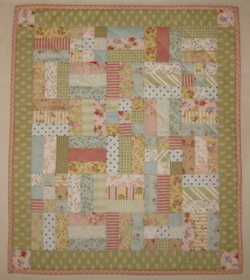 I've finally finished this quilt, Aunt Lillian's Spring Fling by Susan Smith, Patchwork on Stonleigh. 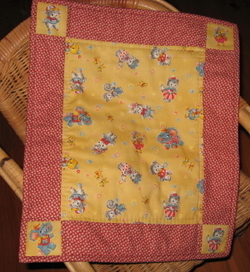 It was quilted over three years ago and had the binding sewn on last October. 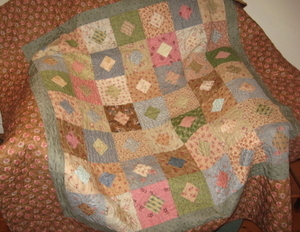 Over the last couple of nights I've cuddled up under the quilt and stitched the binding down. Yes I know, I am a little slow finishing some things. I thought I was finished until I remembered I should label this quilt since it's a gift for my new niece. It's doll size (approx. 18 x 21 inches). I hope, when she's a little older, it gets dragged through the dirt with a doll in tow. I have to confess that I'm very bad at labelling quilts. I've only labelled one other quilt and that was for my daughters 21st. I made this because I fell in love with the fabric. The print is reminiscent of my childhood. Maybe we had books with these colours or motifs, I'm not sure. I've kept it very simple as I wanted to enjoy the fabric. I thought about running the red border all the way around, but in the end, decided to fussy cut my favourite motifs for the corners. Only minimal quilting to retain its simplicity. And NO, its not labelled. 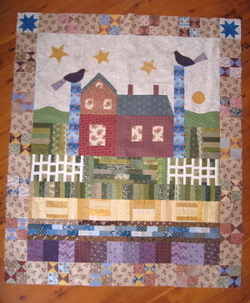 Kathie, who is responsible for me purchasing the Childhood Treasures book and in turn my current obssession with doll quilts, has also made the nine-patch quilt. And there are two new blogs you should pop along and check out Lenora, whose been designing for about 12 months and lives on a dairy farm in South West Victoria and Jenny, from The Stitchery in New Zealand.